The number of arrests for drunkenness is correlated to the number of baptist preachers in America. While your mind searches for a causal relationship between these two events, consider that the explanation is simply due to population increases. Often, however, business publications find successful companies and their attributes and link them causally without any evidence. e.g. "Employee turnover is low at successful companies! Therefore you should focus on lowering employee turnover." Unfortunately, it's quite likely that success causes low employee turnover (higher job satisfaction, more opportunities to move up etc. ), not the other way around. 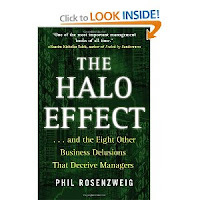 Rosenzweig discusses how the successful consulting firm Bain falls prey to this delusion. To better determine the direction of causality (and/or whether there is any at all), Rosenzweig advises studies that use a longitudinal design.